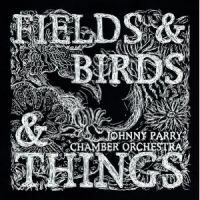 Barring any dodgy attempts at irony, you can be pretty sure that with a name like Johnny Parry Chamber Orchestra you're unlikely to be looking at Ministry Of Sound-style club bangers, and it's also safe to assume you're not buying a one-way ticket to ROFL Central. Oddly though, there are moments of dark humour to be uncovered here; dark humour and a whole host of other emotions, sounds, styles and atmospheres, as 'Fields & Birds & Things' is an album that flits about all over the place. This is a concept on grand scale and is certainly not bereft of ambition, as Parry enlists the help of over thirty musicians and sets his sights on encompassing multiple genres as part of his baroque vision. The term 'chamber pop' has become commonplace and filtrated the mainstream in recent years, but this is far removed from Arcade Fire's indie-rock-with-strings set up. Essentially this is chamber without the pop, making this a piece of work that some may find impenetrable at first, yet once you break through the surface there's a fascinating world to be found. 'Keep Kicking & Screaming' is an early Spiritualized drone overlaid with military drumming and a chorus of voices, it's then followed by maudlin brass and organ over the top of a sampled story a stomach-churning seafaring adventure: "when you get seasick, at first you're afraid you're gonna die, then you're afraid you're not gonna die." It recalls the madcap experimenting of early Gorky's. This combination of antiquated instrumentation with the relatively modern addition of samples is used again to great effect on the simmering finale of 'Find Your Way Home'. In between we're taken on a cinematic tour of sound that takes in monastic chanting ('Rebuild It Piece By Piece'), lachrymose pleading ('God Still Loves Me'), playful operatics ('Love & Death') and much more. Despite the impressive ensemble, 'Fields & Birds & Things', although complex, is an exercise is restraint, staying true to its blueprint and resisting the temptation to indulge in Wagnerian dramatics. It is, therefore, unlikely to go down well at parties, but of course that's not its purpose. This is an impressive, innovative and unique piece of work. If at first the shell seems difficult to break, persevere. Lurking inside is an unusual and enchanting box of secrets.